Our regional (VQA) appellations, Niagara Escarpment and Niagara Peninsula, and our sub appellations – Beamsville Bench, Short Hills Bench, Twenty Mile Bench, Lincoln Lakeshore and Creek Shores – produce Ontario wines recognized and celebrated across Canada and the world. Our tastes are born from our location: The mighty Niagara Escarpment at our back. Magnificent Lake Ontario at our front. Between, soil churned and made complex by grinding glaciers eons ago. And a little magic called the Lake Effect – constantly circulating breezes between the Lake and the Escarpment that moderate temperatures. The Lake Effect slows down Spring warming. Prevents cold air from settling in the Fall, extending our growing season. And warms us up in the dead of Winter. This unique combination of earth and climate are what make Niagara's Twenty Valley an unordinary place to grow fruit and craft wines, luring artisans dedicated to creating their own vision of perfection in a glass. 13th Street Winery, celebrating 20 years and home of the 2017 Grape King, is set amongst 25 acres of estate vineyards, just west of St Catharines. 16 Mile Cellar is a family-owned and operated winery and vineyard that started in 2010. Perched halfway up the Beamsville Bench, nestled between rolling vineyards and natural forest, Angels Gate Winery has been producing award-winning wines in our "Mission" style building for over a decade. 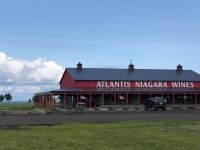 Atlantis Niagara Wines: Atlantis Niagara Wines specializes in producing ultra-premium, Icewine using a hands-on process that has been passed down for generations. Calamus Estate Winery sits beside Ball’s Falls Conservation area near the scenic town of Jordan, Ontario. Charming and historic 1800's era heritage barns house the production area, tasting room, retail store and loft event room. Wine is said to paint a picture on the palette of the place where it was born. As Cave Spring Cellars celebrates thirty years of winemaking excellence, it is with a sense of deep appreciation for the place our wines are born. 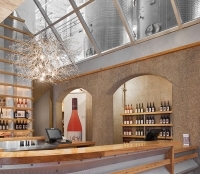 Creekside Estate winery is a quality obsessed winery on the Niagara Peninsula who believe that 'serious' wines can only be made with a generous pinch of experimentation and creativity. 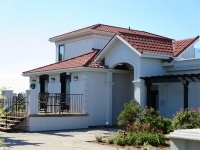 We are nestled among the vines at 4055 Nineteenth Street, Jordan Station, with excellent wines to please your palate. Carrying 17 different VQA, and award winning wines, we are sure to have something just for you! Domaine Queylus is a newly established winery dedicated to a select number of varietals adapted perfectly to the region's soils and micro-climate. This premium winery crafts small lots of Pinot Noir, Chardonnay, Merlot and Cabernet Franc from three estate vineyards in Beamsville and on the Jordan Bench. David Johnson and Louise Engel have poured their hearts into this 23 acre, eco-friendly wine estate tucked into the Niagara Escarpment. Seasonally, lambs nibble on grape leaves to expose the grapes to sunshine, and a trained hawk scares away the nuisance birds that threaten the harvest. Inspired by our life in the Haliburton Highlands, our Wine Lodge sits atop the Beamsville Bench with spectacular views across Lake Ontario. We are open year-round for you to enjoy. Since opening in 2005, Ed Madronich has injected fun and enthusiasm into both the wine and the winery experience. The five-level gravity-fed winery sits atop the escarpment with an incredible 360* view of 80 scenic acres of vineyards and Lake Ontario. While living in Italy as the Ontario Trade Diplomat, Len Crispino was inspired by Amarone wines. 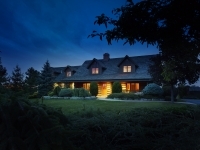 In 2000, he and wife Marisa purchased prime land in Vineland and applied the old-world appassimento technique to a new-world setting. Take a moment, and take one sip. A simple moment in time, to enjoy some very un-simple wines. Experience an intimate glimpse into the art of the ever particular winemaker. Wines are truly crafted. Never a set recipe. A family owned winery boasting 38 acres of property backing onto Carolinian forest and Jordan Harbour. Great, affordable VQA wines are our specialty! Come enjoy our self guided tour. As a family owned and operated winery, we are dedicated to producing wines grown from the distinctive soils and climate of the Niagara Peninsula and most specifically the famous and well regarded Short Hills Bench. Described as a "must see" destination winery, Hernder Estate Wines is known as much for aesthetical appeal as it is for it's award winning wines. Since opening in 1993 with only one varietal, Hernder Estate Wines has over 25 award winning vqa, fruit wines, late harvest and Icewines. Uncompromising attention to detail from vineyard to bottle, coupled with a team dedicated to producing wines with a sense of place and time, is how Hidden Bench has established itself as a premium cool climate estate winery dedicated to the production of terroir focused Pinot Noir, Chardonnay and Riesling. Nestled in quaint Jordan the Honsberger Estate Winery & Bistro is a family run farm that has been in the family since 1811. The estate is the setting for over 50 weddings each summer, and home to the Oven Bistro. The Honsberger Estate Winery is one of Ontario’s smallest boutique wineries producing nationally award-winning wines from grapes grown on the Estate. Kacaba Vineyards & Winery is a family-owned, premium small batch winery located on prime bench land of The Niagara Escarpment in Vineland, Ontario. Smaller batch sizes assure that focus is placed on producing wine of Merit. After many years as a Niagara winemaker, Ilya Senchuk and wife Nadia followed their dream to produce world class, terroir driven from unique plots from across Niagara. London Born Wine Co. is a family run winery that supports the local community and is environmentally friendly. Enjoy the awe-inspiring views from the large picturesque windows while sampling our Marechal Foch made from our 55-year-old vines and other unique vintages. Since planting its first vineyard in 1996, Malivoire has pioneered an innovative, eco-centric approach to wine growing on the Beamsville Bench in the Niagara Peninsula. To build a successful winery you have to start with the best of the basics: location, soil, vines, practices and infrastructure. Come by to taste "Premium wines from the Beamsville Bench" produced from our family vineyard established in 1983. Stroll through sloping vineyards and enjoy the spectacular panoramic views of Lake Ontario's near and far shorelines. West Niagara's leading wine and culinary destination, Peninsula Ridge is the perfect "first and last stop" when touring Wine Country Niagara! World renowned for producing racy yet rich Sauvignon Blancs, brilliant Chardonnays, and sensational Bordeaux reds, Peninsula Ridge beckons with its grand Queen Anne Revival Victorian Mansion and stunning views of Lake Ontario and the Toronto skyline. Rockway Vineyards is the only winery in Ontario which also features an 18-hole championship golf course. Our vineyards are located on premium grape growing land in the Twenty Mile Bench sub-appellation, which allows us to produce quality small batch VQA wines. Rosewood Estates Winery is a boutique winery, founded by a 3rd generation beekeeping family who fell in love with wine. Located in the heart of Niagara on the Beamsville Bench, Rosewood Estates Winery is Niagara's first winery and meadery. Welcome to Sue-Ann Staff Estate Winery, now home to Fancy Farm Girl wines, a quality oriented winery on the family's 200 year old estate, on the Niagara Escarpment in Jordan, Ontario. It's the ultimate assemblage, blending over 100 years of the family's grape growing experience with 18 years of Sue-Ann's award winning winemaking. Situated on the lower slopes of the Niagara Escarpment, Tawse is a family-owned organic and biodynamic winery voted Canada's Winery of the Year in 2010, 2011 and 2012. The inspiration for Moray Tawse's first Niagara property came from his love of Burgundian Pinot Noir and Chardonnay. Since 2008, The Good Earth Winery has been creating delicious, audacious, food-friendly, & 100% VQA wines. Making fewer than 3000 cases per year, we hand-craft each wine, varying our offerings from vintage to vintage. 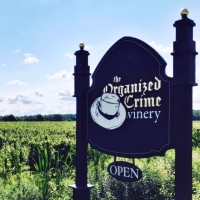 The Organized Crime Winery is a small boutique winery located on the renowned Beamsville Bench in Twenty Valley Region specializing in creating inspired cool climate wines. Thirty Bench is a producer of premium wines grown exclusively on estate vineyards in the Beamsville Bench appellation, a superior winegrowing region on the Niagara Peninsula. The founder of Vieni Estates brings his passion for wine from Italy and combines it with his love for this distinctly Canadian wine region, and particularly the unique attributes of the rolling hills of the Vinemount Ridge. Westcott makes small quantities of handcrafted wines and is very focused on growing and making the best pinot noir and chardonnay wines possible. Established in 2006, they recently opened their retail tasting room and seasonal patio in a local 200-year-old restored barn. Several of our members offer Niagara Winery Tours, it's a great way to see and taste Twenty Valley.